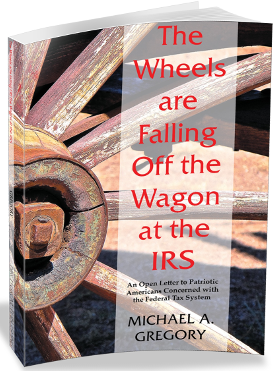 Michael Gregory, a 28-year IRS veteran (now retired), has written a strange book, The Wheels are Falling Off the Wagon at the IRS . His thesis, in short, is that the IRS is being chronically underfunded by Congress, that this may be at the behest of Congresspersons who want the IRS to become a failed agency, that they are on the cusp of succeeding in this quest, and that this will be a cataclysm. This may come as news to some Americans, but some of our elected officials want the wheels to come off the IRS. Some members of Congress are unscrewing the lug nuts off the wheels of the IRS so that the agency will fail in its core functions. Some members of Congress want the wheels of the IRS to fail and for the IRS to be destroyed. If the under-funding continues, the result will be cataclysmic. As funding of the IRS declines, its ability to perform its functions declines. With under-funding, the IRS will be less able to keep up with enforcement and taxpayer support, among other activities, and its diminishment will lead to further spoiling of the IRS’s reputation for fairness and integrity. …Once this happens, the reputation of the IRS will have been diminished beyond repair, and neither the Congress nor the agency will be able to make the IRS credible again. …The net effect long-term is a loss in the public trust that government is fair and its systems work. When faith in government is broken, voluntary compliance with the tax laws goes away, and it becomes clear that no one pays their fair share any more. Scofflaws become the rule rather than the exception. Taxpayers as a whole are not being served at present and my perspective as a retired manager of the IRS is that the IRS is beginning to break apart. If you wish to destroy the American system, the first step would be to de-fund the IRS. One way to convince Americans that the government needs to downsize is to make the government dysfunctional. And the quickest way to make the government dysfunctional is to under-fund its operations. Whether by accident or design, underfunding the IRS will impact our national security and society as we know it. Budget cuts bring distrust in government which in turn will bring a call for even more budget cuts. Starving the beast at the IRS does not make the IRS more productive or efficient, but only less functional. Making the IRS look increasingly incompetent, outdated and inefficient may have unintended consequences. Following this are some dull rambles through the history of the income tax in the United States, and the history and structure of the IRS, that might have made useful appendices in David Foster Wallace’s The Pale King but didn’t add much to Gregory’s argument (which he repeats, in various ways, again and again, as though he can feel he’s not quite getting through to us). He also presents some statistics about the agency’s inability to keep up with audits, with delinquent tax payments, and with customer service, and reproduces some testimony from various oversight boards and ombudspersons in which they too complain about the IRS not having enough budget to do its job. As someone who knows a thing or two about publishing books that are difficult to market and have a tiny-at-best audience, I do not envy Michael Gregory in his hopes of finding readers eager to hear why they should lobby Congress to increase the IRS budget. I found it something of an entertaining skim, however.